Successful innovation in large companies is hard. It is easy to make things complex. We think it is better to keep things simple. Welcome to MIS, your Minimum Innovation Strategy. Join our experiment and put the MIS to action. You have probably seen the same thing; innovation is very, very hard. It’s complicated. Complex. Open to misunderstandings and interpretations. It does not get the resources nor commitments. There is often a lack of shared understanding and shared language. It is difficult. We have spent a lot of time working, thinking and sketching; how can we help make it simpler? How can we help large companies develop a better way, a simpler way, a minimum way? The answer, for now, is MIS – develop a Minimum Innovation Strategy. We aim to make the complex simple. Very simple. We build tools that create impact. An important part of that mission is helping users understand how to use and some best practices around using the Strategy Tools. We are now developing a series of videos, How-To guides and aids to help you put Strategy Tools to work. For MIS, we have created a pilot How-To Guide, and hope this can help you put the Minimum Innovation Strategy to work in your own organization. We are still building and developing the concept of MIS. We have seen it in action. We have seen the impact. But we have not seen or heard your experiences yet. So, we have a challenge or invitation for you (depending on how you see it). Put the MIS to the test in your organization. Post your feedback, learning and reflection on our blog, and get a 30 minute 1:1 skype session with strategy & transformation expert and Designer of Strategy Tools, Christian Rangen. Are you up for it? Print the MIS Canvas (that’s our word for the tool) on a suitable format paper or PVC. We recommend 120 x 90cm, or even 200 x 150cm for groups. 3 – 5 people per group is good. More than six participants and the input and engagement drops. Anyway, print it. Invite some colleagues, co-workers or even top management to an informal workshop session (heck, you can even do this during lunch breaks). Set up and run a rapid workshop on the MIS in action, for your own organization. We suggest giving a 5-10 minute introduction to the tool itself. More time should not be needed. Activate the group(s), get them working on the tool. Get them talking & writing as much and as fast as possible. If all they do is talk, just give them more pens. Ideally, each group should be getting hands on, working on the tool, not just talking to it. Have the groups work 20 – 25 minutes on the tool, depending on the size and maturity. It might be a good idea to have a timer, counting down, to make sure everyone is on the same timetable. What does the MIS tell us about our current innovation strategy? (if there even is one)? Based on the output; what should we do next? Make stuff happen. Try implementing small, incremental changes fast. Run experiments. Write a very brief summary of your observations working with the MIS in your own organization. What happened? What worked well? How did the group take the tool? What was the key success factor in your intro? What was the one thing the group stumbled on? What was the absolute highlight of the process? Post your feedback in the discussion field of this post, either on our website or Linkedin article. Feel free to include some pictures. Let’s set up a 30 minute 1:1 Skype call to go through your MIS workshop. Let’s debrief together and help us understand what worked well and what could be changed at your end. We would genuinely love to talk with you and hear your experiences in putting the Minimum Innovation Strategy to work. Click to schedule a call now. Chris & the team at Engage // Innovate and Strategy Tools. Leading strategic transformation is one of the most challenging tasks executives face. Over the past six years, we’ve developed strategy tools to help clients navigate a dynamic strategy landscape. Today we’re pleased to announce our latest tool — The Transformation Test. Check it out and see how your company’s doing. Over the past three years, our team has spent an increasing amount of time on strategy and transformation. The world of strategy is no longer a linear, easy, more-of-the-same, but is changing into something far more dynamic and complex. Faster change, increasing disruption, unlikely competitors emerging with very, very different business models. Very often, industries are no longer shaped by traditional industry boundaries, but what Professor Rita McGrath calls “arenas”. Industries are no longer stable. They frequently go through strategic inflection points. All of this requires executives in companies to put new strategy tools to the task of building future-fit strategies. At StrategyTools.io, our long-term research program, we have developed a growing number of strategy and innovation tools in use with leading companies around the world. Many of our challenges working with clients in solving their strategic ambitions and challenges comes back to how we deal with large scale change and transformation. To help answer this question, our team has developed a simple-to-use, easy-to-grasp strategy tool called The Transformation Test. While the applications might be profound and complex, our observation is that the tool itself gives you a quick snapshot of your company’s strengths and potentially also weakness in how to successfully lead strategic transformation. The Transformation Test helps teams and management have strategic conversations and measure progress on the topics of innovation, business models and transformation. It asks you questions under the different tenets of transformation — your company’s Innovation Structure, Innovation Portfolio, Innovation Pipeline, your Successes with Business Model Innovation, and finally, your Transformational Capacity. Based on how well you answer the questions set within The Transformation Test, you give yourself a score from 1-5. This helps give a more well-rounded angle on how well you’re doing in terms of transformation. Download The Transformation Test free from StrategyTools.io. https://i0.wp.com/www.engage-innovate.com/wp-content/uploads/2017/05/transformational-capacity-Engage-Innovate-e1494255350556.jpg?fit=1500%2C951&ssl=1 951 1500 Engage//Innovate Team https://www.engage-innovate.com/newsite/wp-content/uploads/2016/11/engage-innovate-logo-main-header-1-300x157.png Engage//Innovate Team2017-05-08 10:59:082017-11-16 12:22:44How's Your Transformation Test? Engage // Innovate co-founder Christian Rangen recently had the pleasure to sit down for a conversation with Columbia Business School professor and globally-recognized expert on strategy, innovation and growth Rita McGrath, to discuss her latest work on strategic inflection points. As a long-time member of Engage // Innovate’s informal Advisory Board, Rita’s thinking has long been an influential and inspirational force. In the short, but very interesting conversation, the two strategy experts delved into innovation as a repeatable process, how companies should react to the early warning signs of impending industry shifts, as well as Rita’s upcoming Executive Strategy Masterclass happening in Stavanger on May 12. If you would like to join the upcoming Masterclass — request your invitation here or learn more about the Masterclass here. You can listen to the talk in the podcast below or read the full transcript here. Rita’s latest research deals with industry shifts and portfolio thinking, a subject highly relevant to the declining oil and gas industry in Norway. As Norwegian executives struggle to move beyond the oil and gas industry, the first step is to recognize that what worked in the past might not be what works in the future. Companies need to be thinking about getting into new areas. “To me, there are two vectors you can choose. You can choose to operate from a capability platform, or you can choose to operate around a particular customer need that you’re serving.” said Rita. Statoil, for example, could choose to operate from deep capabilities in undersea operations and other complex technical capabilities they’ve built over the last decades, or make the bolder move of defining themselves in the energy space and explore options they’ve never traditionally had the capabilities in. Rita pointed out that Fujifilm was a good example of a company that started expanding their portfolio by operating from the capability platform. Today, Fujifilm’s efforts in diversification has brought them into cosmetics, medical imaging, and even services for the pharmaceutical industry. The company is pursuing a variety of different activities all linked at its core to their central capabilities. When asked for a beginner’s guide for management teams that need to find reinvention, Rita advised companies not to stay within their own little bubble. “I think there’s a need to really immerse yourself outside of your immediate context and get a sense of what’s going on in the world that may or may not have anything to do with what you’re looking at”. How does one do this? There are a number of ways. Rita believes that the key is to get away from the daily grind, your emails and the day-to-day, so you can really get a big picture perspective of what could be going on. “When you make the relatively small effort — take a couple of days, go to a non-related industry conference or have conversations with people who don’t touch what you normally touch, it’s surprising how quickly the insights begin to emerge,” she mused. When Rita looked into the architecture behind strategic inflection points, the typical weak signals that could’ve alerted businesses in advance often go unnoticed. “The weak signals are when something happens that creates a 10x shift in the envelope that contains your industry. If you think about any kind of sector or industry or company, they have certain constraints in their environment that are present when they’re born.” said Rita. We’ll take the newspaper industry as an example. Back in the day, the main constraints in the newspaper industry were things like how many contracts they had, how many trucks they needed, how many newsstands they had, etc. Digitalization came along and transformed all these existing constraints by a factor of 10 or 20. The changes don’t happen instantly, and they take a long time to unfold, but only the companies that prepare for them in that time can come out of the 10x shift triumphant. Rita then pointed out Amazon as an example. Amazon sold its first book online back in 1995. That same year, a reporter from Fortune pointed out that the internet could potentially change all the different constraints across several industries like publishing, retail and distribution. The data were there. But nobody in retail was paying attention. Rita believes that businesses should look out for possible industry shifts and plan ahead instead of reacting when it’s upon their doorstep. Rita has developed a tool called the Innovation Maturity Scale to help companies see where they are in terms of innovation proficiency. The scale goes from 1, where companies are hostile towards innovation, up to 8, where the leadership is committed to innovation at all levels. Compared to the innovation maturity Rita sees during her work in California, she believes that most organizations are at a 2 or a 3 on the Innovation Maturity Scale — meaning that they have the desire to improve and innovate, but have no full-on support. “They’ve got pockets of innovation, there are champions that kind of comes and goes. They take the big trip out to Silicon Valley, have a picture taken next to the Facebook sign, but they don’t really have it embedded as an actual proficiency in the organization,”Rita revealed. Norwegian companies are not that different, Christian mused. They are great at initiating innovation, but when it comes to really organizing for innovation as a repeatable process, most Norwegian companies fall short, save for a few. “Telenor is a good example, I know Rita you have been writing about Schibsted as a good example. Kongsberg is a good example. But overall, there’s a lot of work to be done here,” Christian explained. Mature companies often face declining growth as innovation slows down. Companies that want to keep growing must not only focus on their existing business models, but also potential growth areas in the future. “I’m a big believer that you have to be investing your resources in three kinds of initiatives. One is to keep your core business as healthy as you can, which is challenging if it’s in decline or flat. The second is to think about what you’re going to launch that is going to be part of your next core business. The third is how do you invest in strategic options, or early investments that give you the right, but not the obligation to make a significant investment going forward,” Rita said. There are strategy tools that can help frame this, including Strategy Intro, The Three Horizons Framework, and the Three Levels of Business Models. Both Rita McGrath and Christian Rangen will be unveiling new strategy tools at the upcoming Rita McGrath Strategy Masterclass in Stavanger. Request your invite by filling in the form below. Work on your strategy with Rita McGrath on her upcoming visit to Stavanger. Join us for the full-day senior executive strategy Masterclass on May 12, 2017. The Strategic Innovation Canvas is a simple, easy-to-use tool to collaborate on, communicate and develop future-oriented strategy. The Strategic Innovation Canvas is built upon the theories of Clayton Christensen (three types of innovation) and Rita McGrath (discovery-driven growth and short-term competitive advantages). Companies that use the canvas like Statoil, Reckitt Benckiser, and Biotage find that it allows them to shape a very different future for their organization. It’s now been 5 years since the early development of the Strategic Innovation Canvas. The strategy tool has since been put to use in hundreds of companies. We decided to take a look back at history and sat down with the original strategy tool designer Christian Rangen with a few questions. 1. What can the Strategic Innovation Canvas do for my company? The single biggest impact the Strategic Innovation Canvas has is helping management teams and strategists to create a more future-oriented strategy. Most companies are incredibly focused on operations and the status quo. As the pace of innovation and disruption is picking up worldwide, we believe companies need better tools for their future. This has been the driving idea behind Strategy Tools since our early research days back in 2011. We simply must build better strategy tools and the Strategic Innovation Canvas is but one small contribution to this global challenge. The Strategic Innovation Canvas gives you a strategic framework for developing an options-driven innovation portfolio. This builds heavily on one of our advisory board members Rita McGrath’s long-time work on discovery-driven growth and short-term competitive advantages. Companies that use the tool like Statoil, Reckitt Benckiser, and Biotage, realize that they’re able to shape a very different future for their company simply by using a different strategy tool. 2. Where did the canvas originate from? Early during our research, we found a repetitive pattern of thinking in threes. Again and again we saw this becoming very apparent in the field of strategy. One example is the old McKinsey research — The Three Horizons of Growth, where companies need to think about the short term, medium term and the long term at the same time. Equally Clayton Christensen talks about three in terms of sustaining innovation, improving innovation, and market-creating innovations. But we realized that we didn’t really have any good future-oriented tools that brought this level of “three” into practical use. Working with a number of companies including our good friends at Statoil, we started sketching out and prototyping the first designs of the Strategic Innovation Canvas. Using highly innovative companies like Amazon as case studies, we were able to communicate and articulate what this meant in practice. Our goal in the early days was really to build a simple, easy-to-use visual tool that came out of fairly advanced research and understanding of how to shape strategy for the future. And i hope we have achieved that fairly well. 3. How was the early development work? The early development work built on a lot of design workshops with the executives from many industries. The tool was largely built through workshops and testing with executives responsible for designing and shaping strategy across many different industries. This has not been a primarily academic research, but really a genuine co-creation with executives around the world. Following the very early design phase, we quickly took our work on the road and presented the early designs at various innovation conferences, including Copenhagen, Cannes, and Vienna. Again the feedback that we got from the larger innovation community helped confirm our earlier experiences and helped shape this tool further. 4. What’s been your biggest learning? One of the effects of working with the tool is that management teams, strategy teams quickly realize that most of their energy and intellect goes into core business and operational issues. Simply working with the tool forces you and enables you to design a different strategy for the future. Again and again we see management teams surprise themselves when they realized how operationally focused they have become, and they simply do not have a proper strategy and innovation portfolio in place. My biggest learning has been that simply by visualizing on this and starting work on it, companies quickly adapt and start developing better strategic thinking for themselves. With the right facilitation, 300 people can work on shaping company strategy at the same time. | Biotage workshop, Spain. 5. How do you see companies using the tool? What is the best practice when using the Strategic Innovation Canvas? Best practice is really when the tool becomes internalized by leaders and strategists at all levels. This might take time, this might require some training sessions, but once leadership starts using the tool for their own progress, once the strategy team starts using the tool in internal sessions, once mid-level managers pull it out to start to discussing a more ambitious strategy, that’s when the tool really comes to effect. 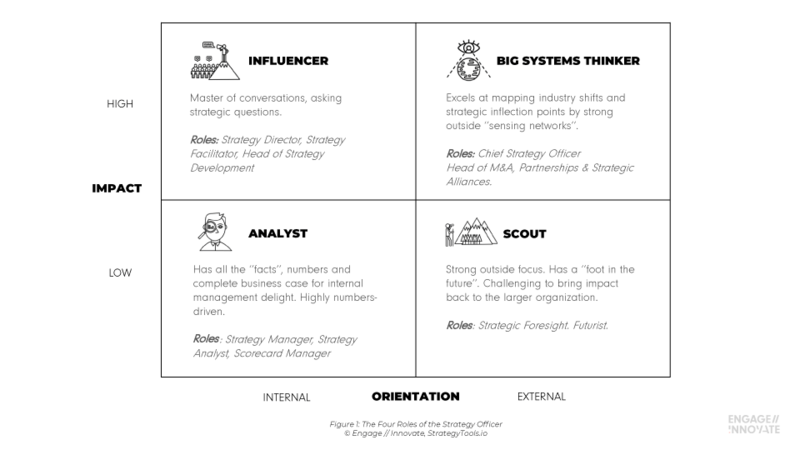 The Strategic Innovation Canvas is not meant for a one-time, one-session use, but really it is a deep strategic tool that should be embedded into the organizational DNA. 6. What do you see next for the Strategic Innovation Canvas? Moving forward, we see three things. One, we see an increasing number of companies putting it to use. Two, we see more and more strategy and innovation teams internalizing it and using it in their everyday work. Three, we’re looking at ways to bring this into a software solution. We are working on our book and our writing in general, to publish more content, insights, and case studies on how our strategy tools are being put to use. This has been work in progress since 2012, and we’re still trying to find time to make more of that happen. Get your own copy of the Strategic Innovation Canvas, free. Grow your company beyond your core business. Book your own in-house workshop now. The Innovation Pyramid is the strategy tool that we always use in our strategy and innovation workshops to establish the basics of innovation. Developed through years of research by innovation experts Christian Rangen & Elisabeth Øvstebø, it is very effective in helping the teams develop a bigger picture of what innovation means in their respective companies. Print The Innovation Pyramid (as large as you can), stick it on a whiteboard or wall before you begin your session with your team. Start from the top, and work your way down through the different levels. Or if you like, you can also work on what you enjoy first. Try to come up with ideas according to each level. Write these down on individual sticky notes. Stick small, logical steps go on the left of the pyramid, according to the levels. Stick the more radical, never-done-before ideas to the right of the pyramid, also according to the levels. Take a step back and admire the stream of ideas you’ve created. The Innovation Pyramid will give you a rough framework to kickstart your innovation strategy. You can then move these ideas onto the Strategic Innovation Canvas to get the engine going. We’d love to hear how you’re using The Innovation Pyramid or any of our other tools. Comment and question away in the comments section below! http://strategytoolsworldtour.com/sign-up' class='avia-button avia-icon_select-no avia-color-theme-color avia-size-x-large avia-position-center ' >Ask us about an in-house workshop today.